(CNN) -- Pilots of the Air France flight that crashed in 2009 and plummeted 38,000 feet in just three minutes and 30 seconds, lost vital speed data, France's Bureau of Investigation and Analysis (BEA) said Friday. The pilots got conflicting air speeds in the minutes leading up to the crash, the interim reports states. The aircraft climbed to 38,000 feet when "the stall warning was triggered and the airplane stalled," the report says. Miles O'Brien, a pilot and aviation analyst, said: "You push down on the wheel to gain air speed, perhaps they (pilots) were getting information that the air speed was too high. Pulling the nose up will exacerbate an aerodynamic stall." The speed displayed on the left primary flight display were "inconsistent" with those on the integrated standby instrument system (ISIS), the report says. What caused the Air France crash? The aircraft experienced some "rolling" before stalling and then descending rapidly into the ocean. The descent lasted 3 minutes and 30 seconds and the engines remained operational, said the report. It plunged at 10,912 feet (3,300 meters) per minute. Richard Quest, CNN's aviation expert, said: "For whatever reason the aircraft speed sensors failed and the A330 went into a high altitude stall. The pilot's actions were unable to recover the aircraft and some might say, made the bad situation worse. "The actual falling from the sky will have been horrific. This plane fell out of the sky." All 228 people aboard the Airbus A330 Flight 447 from Rio de Janeiro to Paris were killed on June 1, 2009. Since the accident, Air France has replaced the pitots on its Airbus fleet with a newer model, Agence-France Presse reports. The report quotes the pilots -- who were not named -- and reveals that they were aware of the storm ahead. In tech's golden age, why can't black boxes do more? Four hours and six minutes into the flight, one of the co-pilots, referred to as PF, called the cabin crew, telling them that: "In two minutes we should enter an area where it'll move about a bit more than at the moment, you should watch out... I'll call you back as soon as we're out of it." The report said that four hours and 10 minutes into the flight: "The autopilot [and] then [the] auto-thrust disengaged," and co-pilot PF said: "I have the controls." The report said the stall warning sounded twice in a row. A short time later the other co-pilot, referred to as PNF said: "So, we've lost the speeds." A second later the stall warnings sounded again the report said. At about this time, "The speed displayed on the left side increased sharply," the report said. The aircraft was then at an altitude of about 37,500 feet. The report said that at this time co-pilot PNF tried several times to call the captain back to the cockpit. The aircraft then climbed to 38,000 feet and at around four hours 11 minutes and 40 seconds into the flight, the captain re-entered the cockpit. During the following seconds all of the recorded speeds became invalid and the stall warning stopped, the report said. Co-pilot PF said: "I don't have any more indications," and the co-pilot PNF said "we have no valid indications." About a minute later co-pilot PF said: "We're going to arrive at level one hundred." This is a height of 10,000 feet. About fifteen seconds later, the data recorder indicate "simultaneous inputs by both pilots on the sidesticks." The recordings stopped at four hours 14 minutes and 28 seconds into the flight. A full investigation into the crash is expected next year. Air France said in a written statement: "It appears... that the initial problem was the failure of the speed probes which led to the disconnection of the autopilot and the loss of the associated piloting protection systems. The crew demonstrated a totally professional attitude and were committed to carrying out their task to the very end and Air France wishes to pay tribute to them." Airbus, manufacturers of the A330, said: "The BEA's work constitutes a significant step towards the identification of the complete chain of events that led to the tragic accident. Airbus is committed to continuing to provide support to the BEA investigation with the objective of identifying all potential lessons to be learnt," according to the Press Association. Earlier this week French air crash investigators said they would be able to identify two bodies recovered this month from the crash site. 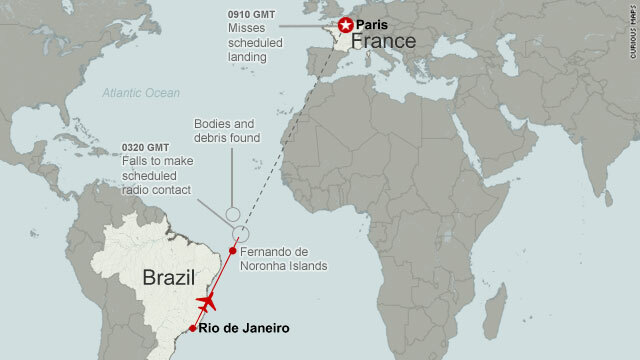 The recovery team is now working on retrieving all the bodies, French officials have said. In early May search teams found the crucial "data recorders" from the wreck site, estimated to lie at a depth of between 2,000 to 4,000 meters (6,562 to 13,124 feet). Air France Flight 447 plummeted 38,000 feet in just three minutes before crashing into the Atlantic, killing 228. Q&A: Mystery of Flight 447 solved? Two years after AF447 plunged into the Atlantic, killing 228 people, a report reveals what caused the crash. It should become easier to find flight data recorders in the wake of the Air France Flight 447 disaster, an aviation industry expert says. The father of one of the victims of the Air France crash argued the remains of those killed should be left on the sea bed. Air France Flight 447's pilots lost vital speed data in the minutes leading up to the crash, investigators say. Why can't black boxes do more? Better technology would have meant relatives of those killed on AF447 could have been spared some anguish.